The progress of spring offers a feast for the senses. Wildflowers are in bloom. Even the smell of lilac blooms, whoch sends me into an allergy tail-spin, is a delight after the monochromatic winter. Trout stream insects are appearing, dancing over fast-moving water. And one of these days soon, trout will be rising and taking these insects. One of the most delightful parts of this season is the variety of light and color. 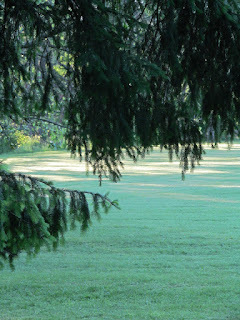 This morning, I enjoyed seeing the contrast of sunrise light and shadows from the woods. Seeing a sunny morning was even more delightful after a four days of rain and overcast. But even the overcast offers gifts of light. For some reason, a rainy or overcast day energizes the greens in a landscape. 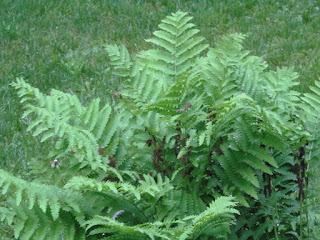 Ferns and other plants become a deeper, more intense green. I am not an expert on why this happens. However, until I learn why, I am going to enjoy the colors and experience!